Blooms and Wishes, or is that Bliss? I love making projects and then changing them so that they are just that bit different from the original. I think that may be one of the reasons I like making videos; it kind of makes me do that anyway. This time it was a fairly easy alternative. All I did was turn the Designer Series Paper over, and there was the basis for the alternative card. I had intended to use the hint of glimmer paper on the original, but it just wasn’t going to work, but it does add a ‘pop’ to the second version. 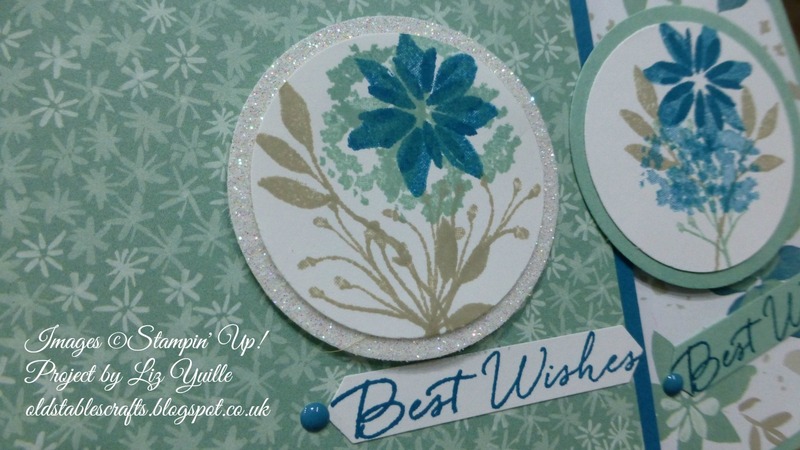 Both cards were really straight forward to make, and did not take many supplies, other than a selection of punches. But you could make the card with squares of card cut on your trimmer, and it would still work well. I hope you give it a go. If you need any of the supplies, they are listed below, so you can just click on the image and jump straight over to my Online Shop. Remember, if you spend more than £25 and use the current Hostess Code, you automatically become a VIP Member, with all the goodness that goes with that. If your order is over £45 (or a multiple of £45) you get to chose a FREE item from the Sale-a-Bration Catalogue. If you have a really big order, over £100, then please look at the Starter Kit, it really is the best value, particularly during Sale-a-Bration, as you get to pick two FREE stamp sets (any from the Annual or Spring/Summer Catalogues, all for £99 including Postage, with no obligation to do anything other than make the most of the Demonstrator discount until the end of June – go on, you know you want to! STARTER KIT = HAVING FUN!